Published by Stephanie, in Eco Friendly Parenting. Tagged with back to school, bike, kids, riding bike to school. I live in Florida. 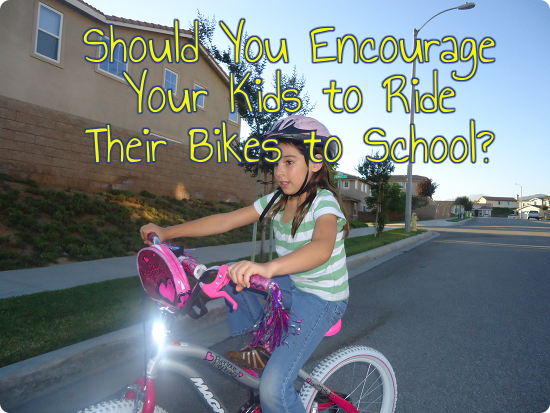 I am NOT a fan of kids going back and forth to school by bike, or walking without an adult. Too many kids have been kidnapped, hit by cars, bullied, etc. Just too many dangers out there. And too many parents are fooled into thinking that just because they are close to the school, or they live in a small town where “nothing ever happens”, they are immune to these dangers. I never, ever let my kids get on or off the bus without myself or their dad there to meet them. Thankfully, our school district has a policy where they will not let the child off the bus, without an authorized adult there to get them. And if it is not the mother or father, they are ID’d and checked against a list of approved guardians. Otherwise, the child is taken back to the school where they wait in the office until an authorized person can pick them up. Statistically, kids are far more likely to die in a car accident than be kidnapped by a stranger. Now if there are family issues that could lead to kidnapping, that’s another deal to be dealt with by individual families and schools, and it may be appropriate to not let those particular children walk or ride bikes to or from school. Similarly, if there has been suspicious people hanging about your area, there may also be legitimate cause for concern. But usually, kids will be just fine. Bullying can happen on school campus too, not just on the way home. I’m not dismissing it, but it’s not prevented by saying kids can’t have this small amount of independence. Kids out in groups are pretty safe from most dangers. Let them walk or ride in groups and they’re more visible to cars and less appealing to bullies or the very rare stranger kidnapper.